While we do lots of cool stuff at VITAL (yoga, fitness, clinics, etc), we are at heart a climbing gym. You don’t need to have any experience to get started and we have climbs for all skill levels. All of our locations are bouldering only. Bouldering is one of the main disciplines of climbing. You don’t need a rope, harness, or belayer - the walls aren’t very tall and are built over a padded floor. 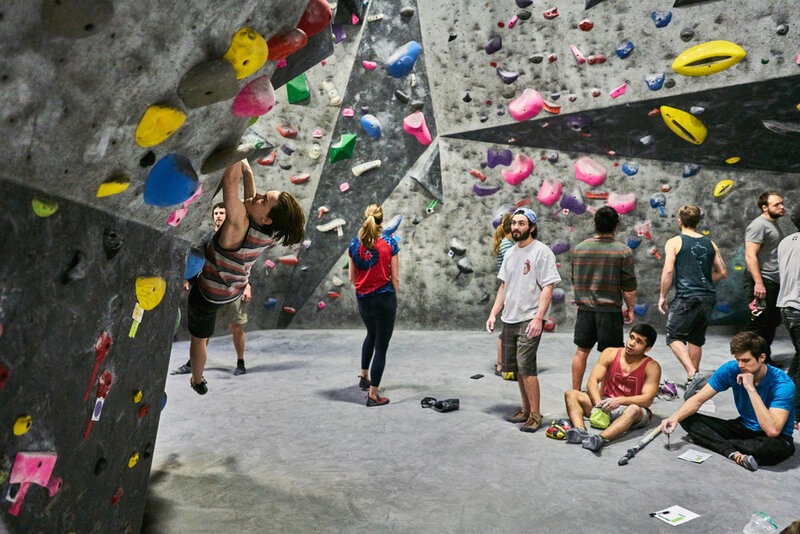 Free from the need of specialized knowledge or equipment, bouldering is a beautifully simple, social, and fun way to climb. Wear comfortable clothes you can move around in. You can certainly climb in your street shoes, but climbing shoes work SO much better. We’ve got rentals at the gym, so bring socks. You don’t need to be a member and can buy a day pass which is valid for the whole day. Most of our customers are members, but lots of people come just for the day. Members have 24/7 access to the gyms. We’re open to the public from 11am to 9pm daily, but only members receive a code to the front door and can use the facility even after the staff has gone home at night. We keep our policies and pricing as simple and straightforward as possible - we don’t charge cancellation fees, initiation fees, or lock people into contracts. Our goal is to create a positive and supportive culture, and we’re sure that you’ll feel welcome here no matter your skill level. Check out our FAQ if you have any more questions.